AUSTRALIA 2019 MR SQUIGGLE AND FRIENDS. AND A SCARCE 1 CENT COIN ALL DATED 2019. 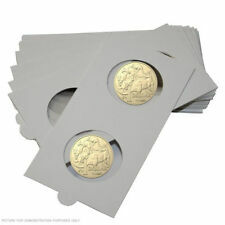 2019 Seven Coin Coloured Uncirculated Set. SET OF 7 UNCIRCULATED COINS IN FOLDER. Adjusting to civilian life was often a huge challenge. 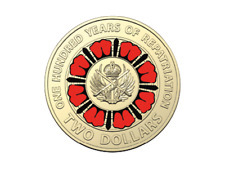 With the release of this coin the Mint recognises the centenary of the vital task of repatriation. Mr Squiggle is a friendly puppet who flew from the Moon in his Rocket, to delight generations of Australian children by using his pencil nose to turn their ‘squiggles’ into drawings. The Royal Australian Mint has created this special uncirculated seven-coin set to delight fans of Mr Squiggle, his friends; Blackboard, Gus and Bill, and their beloved and long-running ABC children’s program. Finish: Coloured circulated. Coin details Mint: Royal Australian Mint. All 3 coins are marked 2019 and have the "35" on the front. All Uncirculated. Gently handled, no fingerprints nor scratches. They (and all these privy marked ones) are from a bag of coins, NOT A ROLL. Cotton & Co certified roll of UNC coins straight from mint bags. Rolls are securely sealed with Cotton & Co's special tamper proof holographic security labels. YES WE DO! Special issue Royal Australian Mint bags only available from the mint containing all UNC coins. Indigenous languages throughout the world are under threat, and Australia has already lost many of its unique and varied Indigenous languages. With this 2019 50c Uncirculated Coin, the Royal Australian Mint along with AIATSIS recognizes 2019 as the International Year of Indigenous Languages. In spite of the challenges of dealing with the issues of morale and the risks of the 1919 influenza pandemic, he accomplished the task in ten months. tens of thousands service personnel were provided with vital support and services. ( RAM MINT ROLL OF 25 UNCIRCULATED COINS). VERY LIMITED NUMBER OF RAM ROLLS ISSUED. IN ORIGINAL RAM ROLLS OF 25 UNCIRCULATED COINS. THIS ROLL IS FROM THE ROYAL AUSTRALIAN MINT. ONE ROLL ONLY. OFFICIAL GENUINE ROYAL AUSTRALIAN MINT. 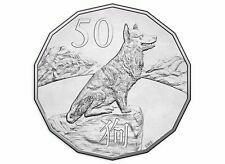 2019 International Year of Indigenous Languages 50 cent straight from a mint bag. Sent with Australia Post Pre-Paid Parcel Post Satchel 500g. 2014 AUSTRALIAN AIATSIS 50 CENT COIN FROM ROYAL AUSTRALIA MINT BAG. ONE (1)Uncirculated Coin from security bag. The coin in the pictures is only to show the product. All coins are silver in colour. In dedication to the International Year of Indigenous Language, the Royal Australian Mint has produced a special new 50c coin. Featuring a design inspired by Australia’s indigenous languages, the mint has managed to fit a number of different words for ‘cash’, ‘money’, or even ‘silver’ upon the coin! In spite of the challenges of dealing with issues of morale and the risks of the 1919 influenza pandemic, he accomplished the task in ten months. • Coin bears a ‘C’ Mintmark not included on the circulating edition. THIS AD IS FOR ONE International Year of Indigenous Languages 2019 50 Cent Coin taken from sealed RAM Sachet as seen in pictures. Reverse design acknowledges Australia’s unique Indigenous languages. The blue haired marionette with his pencil nose is featured along with his good friends; Blackboard, Gus the Snail and Bill the Steam Shovel. 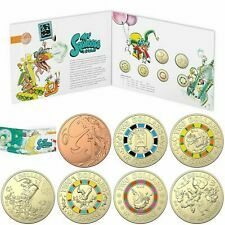 Special seven-coin set featuring the characters of Mr Squiggle, Blackboard, Gus the Snail and Bill the Steam Shovel, plus a special one cent coin featuring the Moon. Lest We Forget . Shiny New UNCIRCULATED. Price is for1 Coin ONLY . Straight Out of a SEALED MINT Bag . Each Coin will be of a very similar condition, nice condition. Direct deposit to my bank account is preferred. 10 x Australian 1966 Silver Round 50 Cent Coins in Average and Better Condition. Year: 1966. We Are Acknowledged By The Perth Mint As A Respected Trader In Perth Mint Products. Grading: Average and Better. 2019 ROYAL AUSTRALIAN MINT UNCIRCULATED SIX COIN YEAR SET - 50TH ANNIVERSARY OF THE MOON LANDING. Fifty years later, the Moon Landing is still regarded as one of the greatest triumphs of human endeavour. 2019 $2 100 YEARS of REPATRIATION ANZAC DAY COIN UNCIRCULATED RED Coloured EX RAM COIN BAG Complete your series with this years ANZAC Coin. For further information, go to the RAM Website. Free standard Postage. It's a must-have for every Australian collector. Opened bag image and coins to show quality of coins in bag. Coins handled with gloved hands. Highly collectable as we do not know when the 5c coins will be discontinued. Official 2018 ANZAC SPIRIT Collection. United 50c COIN in Display Card. 2 x 2019 International Year. Indigenous Languages 50c coins. 2 Circulating 50c coins - Taken from a RAM bag. To recognise 2019 as the International Year of Indigenous Languages, the Royal Australian Mint has issued this Uncirculated 50c Coin in collaboration with the Australian Institute of Aboriginal and Torres Strait Islander Studies (AIATSIS). 5 UNC coins in sealed Royal Australian Mint bag. Coin taken from mint roll. Coins made on a circulation coin press. 2$ Australian Clear Coin Capsules × 20. Suits Two Dollar Australian Coins. 21mm. The coin has a red poppy or the rnzrsa the 3 ferns on the wreath surrounding the poppy represent army navy and air for they also symbolize past ,present and future the unfolding koru pattern evokes a new beginning 1 coin. Coin as issued by the Royal Australian Mint and counterstamped 'S' at Sydney Royal Easter Show. In spite of the challenges of dealing with issues of morale and the risks of the 1919 influenza pandemic, he accomplished the task in ten months. Are you a dedicated coin collector who would love to get your hands on a rare year 2000 mule error Australian $1 coin? These and other rare and treasured coins can be found on eBay. In 2003, astute coin collectors discovered a major fault in some $1 coins released three years earlier. An unknown number of these $1 coins from the year 2000 had actually been minted using the wrong obverse die meant for the Australian 10 cent piece. These error coins were subsequently released into circulation, but it took a significant period of time for people to notice the 1.4mm diameter difference and the appearance of an incorrect 'double rim', which was much thicker than the rim on a standard Australian $1 coin. At that point the 'mule' became a very popular collector's item, and it has held that reputation ever since. While there are now far fewer mules left in circulation, it is still possible to find an original mule coin on eBay if you wish to add one to your collection. Just make sure you do your research first. You want to be absolutely certain you're buying a genuine mule. It is worth comparing images of mule coins and ordinary $1 coins from the year 2000 in order to understand the important difference. As you would expect of coins that were minted in 2000 and may or may not have spent a long time in circulation, these mule coins come in a wide variety of conditions. While some show obvious signs of fatigue from everyday use, as well as the possibility of going through pokie machines hundreds of times, other mule coins remain in very good condition. You will need to read the item description and inspect the photos carefully when attempting to place a value on any mule coin for sale. Some sellers will provide a background story of the mule coin's life, how they came into possession of the mule, and how it has been looked after ever since. On the hunt for rare medieval coins as well? See what you can discover on eBay today!